A statement by Austine Fischer, the terminal’s Communications and Sustainability Manager, made the disclosure in Lagos. ``While handling Safmarine’s vessel, the 62,557 DWT, 4,500 TEU MV Safmarine Chambal, APM Terminals handled 868 container moves during an 11 hour, 30 minutes operation. ``Gross crane productivity was 19 container moves per crane per hour, resulting in berth productivity of 75.63 moves per hour. ``This is the first time APM Terminals have crossed the important benchmark of 75 berth moves per hour and we believe we are the first container terminal in Nigeria to have done so. ``We believe this sets a new benchmark for container terminals in Nigeria,’’ the statement made said. The statement also quoted Jan Thorhauge, Managing Director, Maersk Line, Nigeria, as saying: ``Consistent high terminal berth productivity is a critical cost driver for all shipping lines. ``It translates directly into significant bunker cost savings for the industry and thereby lower overall supply chain costs for the Nigerian importers. 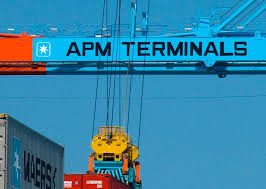 ``Achieving the levels of productivity delivered by APM Terminals on the MV Safmarine Chambai with a Mobile Harbour Crane operation is quite remarkable. ``We are delighted and offer our congratulations to the operational team at APM Terminals’’. The statement added that with a container throughput of 699,000 TEU in 2014, APM Terminals Apapa was the leading container terminal in Nigeria by market share. ``Since 2006, APM Terminals has invested 350 million dollars in expansion and upgrades to infrastructure more than doubling capacity. ``This was while eliminating vessel waiting times, improving productivity and removing bottlenecks thereby reducing supply chain cost for Nigeria’s business community,’’ it said. The statement added that as the only container terminal in Nigeria with rail services, APM Terminals Apapa now operated three weekly rail services to the inland cities of Kaduna and Kano. It said it carried 730km and 960km from Lagos respectively, thereby providing a key corridor to Nigeria’s inland cities and helping to reduce the traffic bottleneck around the Lagos ports.